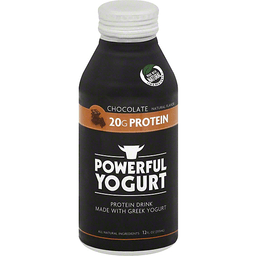 Powerful Yogurt Drink Chocolate. Made with natural ingredients. Naturally flavored. Made with Greek yogurt. 20g Protein. 12 fl. oz. (354 ml). 10g Carbs. 160 Calories. 4g Fat. Excellent source of protein. Gluten free. Produced of domestic and imported ingredients. Visit: www.powerful.co.